Usually the term “Macaroni and Cheese” conjures up images of either a blue box or someone slaving over a big cheesy casserole. Not what we’re talking about here. 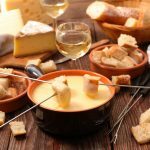 Damn Delicious blog has a wonderful, cheesy, yet health-conscious version that whips up in twenty short minutes. Had a long day and craving this creamy comfort food? This is your dinner! Adding the broccoli and sun dried tomatoes throws in some fiber and nutrients, while light cheese wedges make the sauce thick in texture but low in calories. I sometimes throw in any veggies on hand (shredded carrots, frozen peas, chopped zucchini or yellow summer squash, etc…) to mix it up or use them up. In a large pot of boiling salted water, cook pasta according to package instructions. Add broccoli to the pot 3 minutes before pasta is cooked through; drain well. Heat a large skillet over medium high heat. Whisk in milk, sun dried tomatoes and cheese wedges, until smooth, about 1-2 minutes; season with salt and pepper, to taste. Add pasta, broccoli and chicken and gently toss to combine.